Most of the leads in this category are 10-1/2” collar section 1-1/2” wide. The leash is 6’ long and ¾” wide. The webbing is 650lb test polypropylene. D-rings are lighter weight, un-welded, nickel plated steel. These will fit a medium/small dog with a neck size of about 11" -13". I'll usually have a few leads with a 12" collar section, 2" wide. These are for that "in-between" size dog. 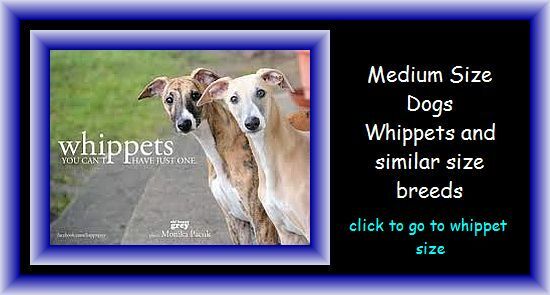 Extra large whippet or very small greyhound, 13" to 14" neck. These leads will be made of the heavier webbing and D-rings, same as the greyhound size.